Confederate officers were expected to provide their own uniforms, and while they were certainly better dressed than most of the enlisted men, their clothing was equally nonuniform. The standards set by the War Department in 1861 for military officer attire were generally observed, but they were subject to the tastes and circumstances of the individual. Coats were of many different cuts and materials, but after the first year of the war, they were usually a shade of gray. 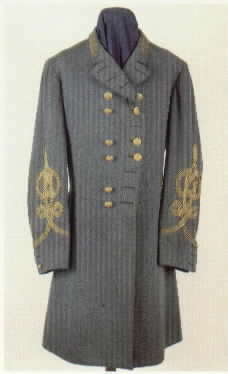 Officers' coats, whether tunics, frock coats, or shell jackets, featured standing collars and were double-breasted, with two rows of seven brass buttons down the front. Generals could be distinguished from other officers by the eagles on their buttons, which were distinctively spaced in pairs. The regulations made no distinctions among the uniforms of different grades of generals, but some major generals adopted the federal custom of spacing their buttons in groups of three. The rank insignia for generals was found on the collar; for all grades, it consisted of three stars encircled by a wreath. Cuffs, collars, edging, and sash of a buff color also denoted the rank of general. Officers had gold braiding on their sleeves in the configuration of the "Austrian knot." Generals' uniforms had four strands of the braiding; lesser ranks had fewer strands. Dark blue trousers trimmed in buff were standard for Confederate generals. Soldiers in all ranks wore a wide variety of hats, with no particular distinction for generals, except possibly for the four-stranded gold braid.